ProSmoke is an all American company based in Chicago. The ProSmoke seems to be a 3-piece model with the cartridge, atomizer and battery. There’s a myriad of flavours you can select from (or get a variety pack). ProSmoke is an all American company based in Chicago and in the world of e-cigs, US/UK made products typically last longer, work better and are more reliable than their China counterparts. This can also lead to them being a lot more expensive but in the case of ProSmoke, that’s not the case. ProSmoke features the perfect amount of items on their website making it very easy to find what you need unlike some sites with so much stuff it can be difficult to even make a decision on what to buy. ProSmoke offers three different kits that all have the same items but the larger kits have extra batteries, chargers, and flavour packs. The ProSmoke seems to be a 3-piece model with the cartridge, atomizer and battery. You screw the atomizer onto the battery first, and then slide the cartridge on. The 3 piece model is great for those looking for a “drip” device. This means you drip e-juice directly onto the atomizer and vape it that way. This produces a lot more vapour but can also lead to your atomizer dying prematurely, especially if vaped while dry. Use caution if using this method. ProSmoke is one of the few companies out there that uses only a VG blend and offers the quite high nicotine level of 28mg. 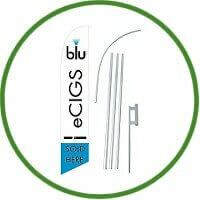 Most companies will do PG or a PG/VG mix and usually have much lower “high” levels of nicotine such as 16 or 18mg. ProSmoke, like most e-cigs does exactly what it’s supposed to do. Various reviews around the net claim ProSmoke makes quite a lot of vapour and hence, they offer interesting flavours and high nicotine levels, this is pretty intriguing for a small unit. There is a lack of negative reviews and this is a bit confusing. Usually, people seem divided on most products. Maybe it’s because it’s relatively new. There aren’t many side effects related to any e-cigs. Three piece models like this sometimes will leak a bit of e-juice into your mouth if you overfill but just stick to a few drops at a time and this can be avoided. You will have the typical nicotine side effects associated with anything that contains nicotine but you won’t have any of the harmful smoke and chemicals from normal cigs. Prosmoke Electronic Cigarette Starter Kit – 2 batteries, 1 atomizer, 1 5-pack of cartridges, wall charger, USB charger, nice magnetic lid box, and user’s manual ProSmoke Electronic Cigarette Super Starter Kit – Same as the normal starter kit but this one comes with 4 5 packs of cartridges in the flavors of your choice or a mix. ProSmoke Electronic Cigarette Deluxe Starter kit – This kit is the same as the Super Starter Kit but it also comes with a Portable Charging Case to hold and charge your batteries and hold your cartridges. This is about the size of a normal pack of cigarettes and recharges via USB. Overall, I think the ProSmoke seems like a pretty good value with a lot to offer. There’s a myriad of flavours you can select from (or get a variety pack), the nicotine levels are great for tapering down or simply substituting for real cigs and there are a few different starter kits to choose from. You will like the look of the ProSmoke too. It’s very similar to a normal cigarette.